There’s lots of unrest in medicine right now. Physicians in America get licensed by their state to practice medicine. This is a legal requirement. And, as you might imagine, lots of stuff goes into getting that license. You first get your education, then you take some tests, then you get more education, then you take more tests, then you get continuing education… And, you get the point. There’s also something known as physician board certification. It’s really not supposed to have anything to do with the law; yet, admittedly, in recent years, the controlling organizations that hand out these board certifications have gotten some of it written into law. But, that’s another story. The concept of medical board certification was formally established in the 1920s and 1930s. It originated from “people” seeking to answer the question: how do you know your doctor is competent? You might think those “people” searching for an answer to that question were the general public, but there’s actually no empirical evidence that public demands played any role at all. In fact, as Dr. Michel Accad has pointed out, even late 19th-century patients in backwater Rochester, Minnesota, appeared to perfectly be able to judge physician quality without the help of any certifications whatsoever. But, then again, that’s also another story. Regardless, times were different back then. In the 1920s and 1930s, we had less “overseeing” going on in medicine. As for now? Well, that’s less of a problem. In addition to the state medical boards, we currently have the Drug Enforcement Agency (DEA), Centers for Medicare and Medicaid Services (CMS), Physician Quality Reporting Measures, Meaningful Use, individual hospital credentialing boards, insurance companies, peer-reviewers at the insurance companies, national physician data banks, quality registries, and the entire legal-liability tort industry providing oversight. To be honest, it can be challenging on some days for a doctor to even obtain “permission” from a payer to see a patient. It’s almost as if someone thinks physicians are coercing people to enter their lobbies by tricking them with subliminal messages into having diseases. Is there even a role for medical board certification anymore? Before you give your opinion, just admit that it’s a fair question. Either the concept of board certification is needed as an addition to everything else that’s currently being required of physicians, or it’s not. Either board exams are still relevant in establishing physician accountability, or they have become outdated for mainstream physicians. Think about it. If you are going to track physician outcomes, attempt to measure physician quality with all types of quasi-value metrics, and even issue government-tabulated grades to physicians between zero and 100 (yes, current legislation has placed this into law! ), do you really need another costly certification to further add to the system? Seems like semi-mandating all of the above and then a board certification just implies that neither is doing its job. So, I’ll ask the question again: Is there a role for medical board certification in modern times? Dr. Bob Wachter thinks so. For years, Bob held an influential position within a medical board certification organization. He recently wrote an article defending the work of his prior group known as the American Board of Internal Medicine (ABIM). He argued that ABIM is still a necessity for modern medicine. He pleaded that ABIM’s ivory tower must not collapse under the current weight of hefty allegations made against it. Bob is an eloquent writer. And, though I’ve never met him, he’s obviously an intelligent guy. When he broke his silence on this issue with his recent article, he knew that he would open himself up to critics, and he wrote it anyway. I like boldness. Bob also gave a believable and sincere defense of ABIM’s current leader, Dr. Rich Baron. He even re-Tweeted opposing comments to his article on his own social media account, presumably to display both sides of the issues at hand. Then, he mentioned something known as the ABIM Foundation. The ABIM Foundation is an affiliate organization of the ABIM. You should know that although they are linked, it took quite a few years before the ABIM mentioned to its physician members that it had another financially-funded brother. Think of it as hiding a sibling in the basement who just happens to be a hedge-fund manager. This ABIM “Foundation” of sorts, turns out to be another tax-exempt organization granted charity status by the Internal Revenue Service (IRS). The Foundation has been the recipient of tens of millions of dollars obtained from physician testing fees, and you can read more about how these funds have been used from the research done by Dr. Wes Fisher. But, what I want to tell you about, is something that the Foundation has funded other than the income of its executives–something that Bob Wachter is very proud of–the Choosing Wisely® campaign. It almost sounds like an anti-drug or anti-smoking crusade, or a much needed parenting lecture for teenagers. But, the campaign is really about encouraging doctors to eliminate unnecessary tests and procedures. Sounds like a great idea, doesn’t it? Nobody wants anything that’s unnecessary. But, when you find yourself thinking on the side of the majority, it’s time to reflect. Mark Twain said that, and indeed, cautious you should be when any idea sounds too perfect. You might have thought this was the point of medical school, or continuing medical education, or physician quality metrics, or even board certifications; but, third-parties mooching off the system in the name of quality is the new game of American medicine, so why not? It’s kind of like the story about the man who got lost driving to his new house one day. His friend made sure it wouldn’t happen again by painting a dashed-line on the road to guide him home. That worked fine, but another friend felt that signs with arrows at every intersection should be placed just in case. A close family member thought that if a few signs could help, more would obviously be better, and signs were then placed on the side of the road every few yards. Before too long, people who didn’t even know the man were standing on the road holding signs with words to help him out. Ultimately, the man couldn’t see the dashed-line anymore. In fact, even though he knew his way home by now, he couldn’t make it there for all of the obstacles in his path. But, I get it, this isn’t about roads and signs. We are talking about Choosing Wisely®. Surely that campaign can’t be detrimental to your health, right? Well, let’s think about it. Let’s fund certain organizations with grant money to publish lists of “abused or overused tests.” Interesting idea. But, who are these organizations? To whom are they providing value? The patient? Or themselves? Whose value system will we use in determining these lists? One built upon a foundation of medicine or no medicine at all? Should the list be evidence-based? Great. I agree. Whose evidence? Since no data is absolute, whose value lens should we use to interpret it? An excellent example of this point occurred last year when the executive committee of the American College of Cardiology had to reverse its stand that unblocking more than one heart artery (not just the culprit artery) during a heart attack was costly and unnecessary.Turns out that those choosing badly in years past had really been choosing wisely all along. What Bob forgot to mention in his article is that Choosing Wisely® has become just another flawed witch hunt focused on eliminating patient-physician choices for diagnostic testing and therapies. And, who is leading its charge? I told you, an affiliate of the ABIM. And, who might be representative of ABIM’s leadership? People actively choosing wisely for their own patients? Not really. In 2014, when randomly selecting medical journal articles published by ABIM staff and physician leadership for review, the median number of Medicare patients seen over an entire year by these ABIM leaders was found to be zero. That’s right, of the 150 randomly selected authors with ties to ABIM leadership, the median number of Medicare patient encounters per person in this group for the entire year was zero. Reading Bob’s article, I just find it ironic that ABIM’s board certification and Choosing Wisely® campaign get mentioned alongside each other. Their philosophies are polar opposites. Choosing Wisely® is about less. Board certification is about more. More modules, more questions, more improvement projects. Choosing Wisely® is about spending less money on patients without consideration for individual wishes. 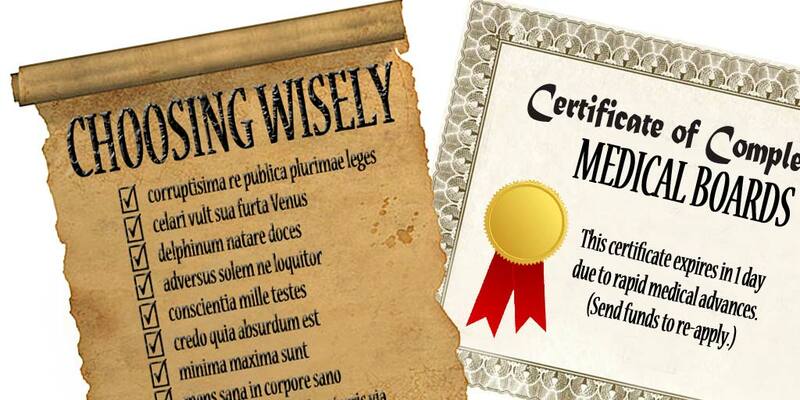 Board Certification is about physicians spending more dollars without proof of greater value. One concept promotes rationing. The other idea has led to financial abundance of a Foundation. Recently, neither seem to have much to do with quality. Regarding board certification, Bob’s right about one thing. You can always make it harder. But, that doesn’t make it relevant. You can force a physician to mountain climb blindfolded to claim a title. It’s a grand challenge. But, will she be a better doctor by doing it? Or, have we just stollen time away from those who need her skill-set the most? There are many decisions that physicians currently face. Board certification or not? Submission of quasi-quality metrics or not? Participation in meaningful use or not? Accepting third-party payers or not? Ultimately, the medical profession will best advance when its physician professionals voluntarily support only what they believe is relevant. And, physicians, it’s still our choice. As always, your post hits home. After struggling with not being able to understand the direction administrators have taken our profession, along w “quality metrics,” PCMH, MU (and the list goes on…), I have chosen to leave “traditional practice” for the world of Direct Primary Care. Patients deserve better: they deserve time with their doctor, they deserve to be heard when they have health concerns, they deserve to be billed honestly. I pray that my patients & I have chosen wisely together. 1. Pareto distribution. 80% of docs are a hardworking, compassionate, self-sacrificing, self-effacing lot working with integrity. 20% are bad apples not demonstrating those characteristics and to whom regulations and certifications are directed. The rest, the 80%’s, are burdened. 2. Self-regulation. Doctors did not do this well. But to be fair, no industry does because the pursuit of self-interest–whether airline, banking, politics, the church–is a powerful human condition. 3. Business acumen. Unfortunately the Pareto distribution is reversed on this–80% of us are horrible at the business of medicine; 20%, like yourself, get it. This leaves the window 80% open for non-clinical managers to step in and run our industry. 4. Price Escalation. We haven’t been transparent to ourselves and to the public regarding our role in price escalation subsequent to June 30, 1965. We “made a deal with the devil”–so to speak–and we fully exploited that deal (see #2), yet, now we cry foul and point fingers of blame. Given the legacy conditions and a faux fee-for-service healthcare system, our current reality (or some similar version) was unavoidable. The opportunity before us is a course correction based on an understanding of behavioral economics. Thanks for your comments. Regarding the “metaphor” of self-regulation, I suspect you will enjoy reading the following short piece by Dr. Michel Accad (http://alertandoriented.com/reasons-to-moc-board-certification-revisited/). The part on self-regulation is toward the bottom. A “course correction” is needed. And, as you mentioned in a previous comment, it is really all about how to best establish accountability rather than quasi-quality. You might also enjoy a 20-minute talk I’ll be giving at #DRSUMMIT15 (letmydoctorpractice.org) on July 23rd titled “The Government Takeover of Quality in Medicine.” I’ll post the webcast link as this date nears.